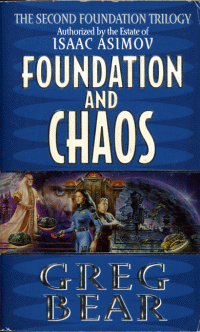 For those that read my previous review on Foundation’s Fear, you will be pleased to find that Greg Bear manages to save this series with his masterful work in Foundation and Chaos. If there were ever two books on the same subject that could be so different as to compare night and day, the first two parts of the Second Foundation Trilogy are it. While the first volume kept putting me to sleep with rambling on about simulated minds and aliens, Foundation and Chaos goes back to the roots more in line with the universe Asimov made me fall in love with. I never really liked the subplot with the sims and meme entities, and was glad to see that Greg Bear minimized their role as much as he could. Also, he worked worm holes out of the picture rather masterfully, however I’m not sure if Benford had planned this ahead of time or not. Either way, I think that adding worm holes was a mistake. Another significant difference is the smooth flow between plot lines, rather than spending up to 100 pages in one setting. I found myself plowing through this book faster than normal, as the action was always there or just around the corner. The last 100 pages, comprising one fourth of the total book, went by in a flash of constant action. A main point that many others have noted as a flaw in this book is that this is more of a Robot novel rather than a Foundation novel. One of the main plot lines involves a battle between robots loyal to Daneel (Giskardians), and robots which reject the Zeroth Law (Calvinians). There is more dialogue between robots here than possibly every other Foundation novel combined. I enjoyed the Robot Series immensely, so this became one of my favorite books in my project written by someone other than Asimov. The main story arc revolves around the preparation for Hari Seldon’s trial for treason. He has been brought up on charges for declaring that the Trantor will fail within 500 years, followed by the rest of the Galactic Empire. I’ve you’ve read Forward the Foundation or the original Foundation, you know Hari is cleared of all charges, and the Foundation project Encyclopedists are sent to Terminus to begin working on the Encyclopedia Galactica. This book goes behind the scenes to show exactly how this all came to be. Lodovik Trema, a humaniform robot working for Daneel, turns out to be one of the more interesting characters in this book. The book opens with him on a rescue mission headed for a planet which is about to be destroyed by a supernova shockwave. Something goes wrong with the hyperspace Jump and they pop out in the middle of a concentrated neutrino wave. Somehow he feels different but doesn’t immediately know what is wrong. Plenty of interesting questions and situations revolve around this particular change. I can’t really explain in words how much better this novel is than Foundation’s Fear. I think I will probably seek out other works by Greg Bear once my project is complete. I hope that the next novel will do the series as much justice as this one did.